Over the course of the last few years, the music industry has been struggling to cope with the way iTunes single-handedly changed the way music was consumed, from albums to $0.99 singles. But is this earth change in the music industry simply due to iTunes’ ability to allow users to purchase just the songs they want, or could pricing fix the problem? According to Eric Garland, CEO of Big Champagne, speaking at the New Music Seminar this week, the real thing killing the album is that $9.99 for an album doesn’t offer a significant discount over the per unit price of a $0.99 song, while historically, consumers have gotten a better deal on albums versus singles. “Historically, the price of an album was five times greater than a single,” said Silverman, who believes setting the price at a tenth of an album’s cost was a mistake and that even $1.29 is too low. “It should’ve been a $1.99, and then we would’ve seen higher digital album sales because it would’ve been a bigger discount for buying an album. The good news for album fans like me is that the $9.99 price of albums is slowly but surely making some headway: 14% of all Universal Music’s digital sales these days are for complete albums. 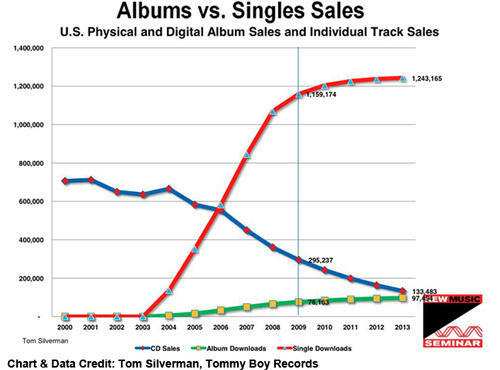 iTunes hasn’t necessarily killed the album… it’s just put it in semi-hibernation.